In addition to Switzerland, London, and Germany, the gold markets in Austria, Italy and France are important European gold centres in their own right. All 3 countries hold substantial central bank gold holdings, with Italy and France each holding more than 2,400 tonnes in their official reserves, making them the 4th and 5th largest global official sector gold holders, respectively, (or 3rd and 4th largest excluding the IMF’s gold holdings). Italy was traditionally one of the world’s largest gold jewellery centres, and still hosts an important gold jewellery/goldsmith sector in addition to a number of precious metals refineries which also sell and trade gold. Although the Paris Gold Market has been overshadowed by that of London, some of the largest bullion banks are still headquartered in Paris, and up until the early 2000s, the Paris gold market still held a daily price fixing. In Austria, as in Germany, the banking sector plays an important role in the gold market, and Austria also hosts the world famous Austrian Mint in Vienna which supplies gold around the world, as well as fulfilling Austria’s substantial domestic demand for investment gold bullion and coins. The Austrian Mint is located in Austria’s capital city, Vienna, and is 100% owned by the Austrian Central Bank. The Mint produces the flagship Vienna Philharmonic 1 ounce gold bullion coin, and smaller variants of the coin in denominations of ½ oz, ¼ oz, 1/10 oz, and 1/25 oz. The 1 ounce gold Philharmonic was first produced in 1989, so has been in production for over 25 years now. Interestingly, the gold Philharmonic coins are legal tender in the Eurozone (the 1oz gold Philharmonic has a face value of €100), and because they are legal tender, they are VAT free to purchase in the Eurozone. The largest markets for the Vienna Philharmonic gold coins are Europe, followed by North America and Japan. Notably, the Philharmonic is the highest selling gold coin in the Japanese market. In 2014, the Austrian Mint sold gold coins containing 483,700 ozs of gold (15 tonnes), of which 419,000 ozs comprised the 1oz gold coins. Comparable production figures for 2013 and 2012 were 652,000 oz and 400,000 ozs respectively. The Mint also manufactures gold bars in a range from 1 gram up to 1 kilogram in weight. In total, gold bar production accounted for 410,000 ozs (12.75 tonnes) of gold in 2014. Therefore, the Austrian Mint produced products that used nearly 30 tonnes of gold in 2014. See page 72 of 2014 annual report for details. Gold bullion/bars/coins comprised about 80% of the Mint’s sales (revenue) in 2014. Additionally, the Mint also produces precious metal blanks (gold and silver) for other government-owned and private mints. Note that the Austrian Mint is also one of the four shareholders in the giant Swiss precious metals refinery Argor-Heraeus, along with German group Heraeus (owner of the Heraeus refinery), Germany’s Commerzbank, and Argor-Heraeus management. The Ögussa precious metals refinery, headquartered in Vienna, traces its origins back to 1862. It became fully owned by Germany’s Degussa in 1990 and then in 2003 became part of the Belgian headquartered Umicore group. Ögussa sells gold bars to business clients and buys scrap from business clients, and produces gold bars in 11 sizes up to 1kg. Private clients can also sell scrap gold and other precious metals directly to the refinery, and also buy gold bars from Ögussa branches, of which there are 8 branches throughout Austria and with 1 branch in Prague, Czech Republic. Gold coins and bars are widely available for purchase and resale in the branch networks of most of Austria’s large commercial and savings bank network. Bank Austria, part of the Unicredit Group, operates 170 branches within Austria and 2,300 branches across 13 countries in Central and Eastern Europe (CEE) and in Turkey. The CCE branches trade under the Unicredit brand but are subsidiaries of Bank Austria. Bank Austria branches sell and buy a wide variety of bullion gold coins including the Vienna Philharmonic, the Maple Leaf, the Krugerreand etc, as well as historical restrikes of the original Austrian circulation gold ducats, guilders and crowns, and gold bars ranging in denominations from 1 gram up to1 kilogram (including some kinebars with the kinegram visual security feature). The full list of gold coins and bars traded by Bank Austria’s retail branches can be seen on the Bank’s website. The Raiffeisen banking group, headquartered in Vienna, is active in the Austrian (and the CEE) gold market. The Raiffeisen group structure consists of 473 independent Raiffeisen banks (comprising nearly 1,600 branches). These banks are located in 8 of the 9 Austrian provinces, where there are 8 Raiffeisen regional headquarters. The group is headed by Raiffeisen Zentralbank (RZB) (in English Raiffeisen Central Bank). Raiffeisen Bank International (RBI) (also HQ in Vienna) is a company within the RZB group, and within the RBI group are a network of 15 banks in the CEE and other foreign branches of RBI. Raiffeisen branches offer bullion gold coins including all denominations of the Vienna Philharmonic and an Austrian gold coin called the Schilling Babenberger, as well as restrikes of the old Austrian circulation gold ducats, coronas and guilders. The ‘Erste Bank und Sparkassen’ group, part of the Erste Group, consists of 48 retail focused bank institutions located in all Austrian regions outside of Vienna. Erste Group is one of the largest banking groups in the Central and Eastern Europe and is headquartered in Austria. Erste Bank und Sparkassen offers its customers an extensive selection of gold coins and bars. The physical gold product offering includes Vienna Philharmonics and gold bars (1g to 1kg) from the Austrian Mint, historical Austrian ducats, coronas and guilders, and international bullion coins from the main precious metals mints such as Krugerrands, Maple Leafs, American Eagles, Britannias, Kangaroos and Pandas. A full extensive list is viewable on the Erste Group website. The Erste group also offers gold certificates, and are the authors of the well-known ‘In Gold We Trust’ yearly report on gold. Steiermärkische Sparkasse operates 19 savings banks Styria, which is one of the 9 provinces in Austria. It also has operations in most of the countries of former Yugoslavia. This Sparkasse (of which Erste is a shaeholder) offers its customers Vienna Philharmonic gold bullion coins, historical gold ducat coins, and a range of Austrian Mint gold bars in denominations from 1 gram up to 1 kilogram. Schelhammer und Schattera Bankhaus, Vienna’s oldest private bank that is now controlled by Grazer Wechselseitigen Versicherung, offers a buy and sell dealing service for gold bars, Austrian Philharmonics, and Austrian ducat, corona and guilder coin coins. 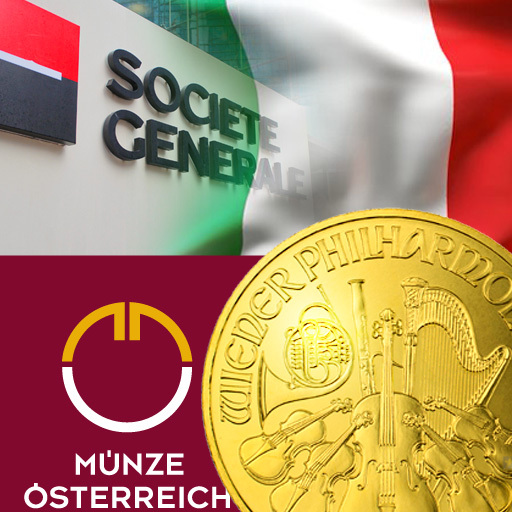 The Austrian Mint owns large precious metals trading company Schoeller Muenzhandel, which is also headquartered in Vienna. Schoeller Muenzhandel is one of the biggest precious metals wholesalers in the Austrian gold market, as well as in Germany, and other countries in the central European region, and it maintains branches in Graz and Innsbruck in Austria, and a German branch office in Freiburg. A-Mark[A-Mark http://www.amark.com/], the large US precious metals trading company which is headquartered in Los Angeles, also has a branch office in the Austrian gold market through its Vienna office. This office provides European coverage and extended hours trading coverage to its US parent. Finally, Pro Aurum, the German based precious metals wholesaler, has a substantial presence in Austria through its Vienna branch office. Before 1939, there was a free gold market in Paris. Then, from the start of WWII in 1939 until 1948, the Paris gold market remained closed since French residents were prohibited from owning and trading in gold. When the Paris Gold Market re-opened in February 1948, it remained a purely domestic gold market with imports and exports of golf prohibited, except for a short while in 1968 when international trade was allowed. In its heyday up until the 1980s, there were 8 members of the Paris gold market, namely, Banque de I’Indochine, Banque Nationale de Paris(BNP), Banque de Paris et des Pays-Bas, Compagnie Parisienne de Reescompte(CPR), Credit Lyonnais, Lazard Freres, Société Générale, and the Chambre Synidcale de la Compagnie des Agents de Change (which was the entity that actually operated the marketplace). Representatives of these companies met in a room in the Bourse de Paris every day and traded among themselves and their clients, quoting prices for a variety of physical gold products including the Lingot (a 1 kg gold bar of 995 fineness), the French Napolean gold coin, half-Napolean, Swiss Vrenelli, British Sovereign, Mexiacan peso coins, US gold coins, Netherlands guilder coins etc. There were also 2 daily ‘fixes’ at that time, one between 12:15pm and 2:30pm with a trading session between 12:30pm and 1:00pm. Fast forward to 2004, and there were only 3 participants left in the downsized Paris Gold Market, namely, Compagnie Parisienne de Réescompte (CPR), Credit Nord and Cookson France. This downsizing was the result of a number of factors, such as banking mergers, but also factors such as the imposition of an 8% sales tax on gold transactions by the French Government and the requirement for gold sellers to provide their identities when selling, which pushed the Paris gold market underground to some extent. By 2004, the market’s fixing meetings were also taking place by conference call, and the Paris Bourse was being operated by Euronext Paris, since Paris Bourse had merged with the Amsterdam and Brussels exchanges in March 2001. Then in July 2004, Crédit du Nord announced that it was fully withdrawing from the market. This exit by Credit Nord then forced Euronext Paris to suspend/close the market price on 2 August 2004 since Euronext said that having a market with only 2 participants (CPR and Cookson France) was not transparent, and besides, Cookson France did not do much trading on the Bourse. Given this vacuum in 2004, CPR essentially stepped in and took over the role of providing daily prices in an unofficial capacity. According to the Wall Street Journal in 2004, “CPR controlled 98% of the market until Credit du Nord’s decision to pull out”, so CPR was practically the entire market anyway. Since 2004 at 1pm on a daily basis, CPR now lists the reference prices of 20 gold products most commonly traded in France, including the Napoleon gold coin, the 1kg bar, the 20 Swiss franc coin, the Sovereign , the Krugerrand, and Mexican peso etc. Many people outside France may never have heard of CPR, however, it is the largest supplier of physical investment gold in France, as well as being the foremost supplier of banknotes and travellers cheques in France. In 2005, the Tessi Group acquired 80% of CPR (CPR Billets as it was then known). Then in 2009, CPR Billets changed its name to CPoR Devises (meaning CP – oR Currencies to reflect its concentration on gold and currencies). Currently, CPoR Devises is still 80% owned by the Tessi Group and 20% by Crédit Agricole. Up until late 2008, the company used the website www.cpror.com, after which it switched to using its current website. CPoR Devises is a wholesale supplier of gold bars and coins to banks and other gold distributors in France, a supplier of gold to customers of French bank networks, and provides a gold storage service. CPoR still produces daily quotation prices for a range of gold products on its website, uncannily similar to the range of products traded in the historic Paris gold market, and also profiles all of these products on its gold products pages. In 2010, CPoR launched a range of own branded small gold bars, of 999.9 fineness in denominations from 1oz up to 500 grams, which are manufactured by MKS PAMP in Switzerland. Recalling the members of the Paris Gold Market from the early 1980s, most of these companies didn’t necessarily disappear from the market, they just merged with, or were acquired by each other. Banque Nationale de Paris (BNP) merged with Banque de Paris et des Pays-Bas (Paribas) in 2000 to form BNP Paribas. Société Générale still exists as a standalone entity, however Credit du Nord, which left the gold market in 2004, is a subsidiary of SocGen. Banque de I’Indochine and Credit Lyonnais eventually ended up being owned by Crédit Agricole. Compagnie Parisienne de Reescompte(CPR) is still in existence and is 20% owned by Crédit Agricole. Lazard Freres is now known as Lazard and concentrates on corporate finance and asset management. Notably, most of these resulting banks are still big players in the gold market. They merely moved their gold operations from Paris to London. Four large French investment bank are members of the London Bullion Market Association (LBMA). Société Générale (SocGen), one of the five members of the previous London daily gold fixing process, and now a direct participant in the LBMA Gold Price, is an LBMA spot market maker in gold and silver. BNP Paribasis an LBMA forward market maker in gold and silver. Credit Agricole CIB is an ordinary LBMA member, and while not an ‘LBMA market maker’ in London, Credit Agricole is a market maker in its own dealing rooms in Paris, Hong Kong, New York, London, and Tokyo in gold, silver, platinum and palladium. And finally, Natixis, which does not have a connection to the former members of the Paris Gold Market  is an Ordinary member of the LBMA. A number of well-known gold refining operations historically operated in the French gold market in the areas in and around Paris and Lyon, including names such as Compagnie des Metaux Precieux (CMP), Comptoir Lyon Alemand Louyot (CLAL), and Engelhard. CMP was acquired by Englehard in the early 1980s, and CLAL and Englehard established a joint venture in late 1995, known as Engelhard-CLAL. CLAL was then acquired by Cookson Precious Metals to form Cookson-CLAL, and German refiner Heimerle + Meule acquired the Cookson group in 2013. BASF acquired Engelhard in 2006. The above gold refineries are on the former LBMA Good Delivery List for gold, however, there are no French based gold refineries on the LBMA’s current Good Delivery List for gold. A gold refinery called Société d’Affinage et Apprêts de Métaux Précieux (SAAMP), currently operates from Limonest, just north-west of Lyon, mostly processing recycled gold, and also offering gold trading services. France holds gold reserves of 2,436 tonnes of gold, 90% of which are stored in the vaults of the Banque de France in Paris, and the other 10% abroad. The Banque de France also provides gold services for other central banks and official sector institutions such as gold brokerage, gold custody in Paris (eg. for the Bundesbank), and gold deposits (gold lending) and swaps. Until 2013, the Banque de France also published daily gold prices for the Napolean gold coin and a 1 kg gold bar on its own website. By 2014, the Banque also introduced quotations for 1 troy ounce of gold. Then beginning on 1 September 2014, the Napolean and 1 kg gold bar quotations were completely replaced by the exclusive publication of the USD and Euro price of 1 troy ounce of gold. Until the late 1990s, Italy was one of the world’s largest gold jewelry fabricators and gold jewellery exportering nations. In fact, during the 20th century, three of the four large Swiss gold refineries (Valcambi, PAMP and Argor-Heraeus) established their operations adjacent to the Italian boarder in the south of Canton of Ticino (in southern Switzerland), so as to be as close as possible to the Italian gold jewellery market. For example, Valcambi describes its location as “half an hour from Milan in Italy to the south. The closest international airport is Milan Malpensa, a 30 minutes drive from the plant across the border from Italy into Switzerland.”. Italy’s goldsmiths have historically clustered in three main areas, namely, Arezzo in Tuscany, Vicenza in Veneto, and Alessandria in Piedmont. Milan would also be considered a sizeable hub of Italian goldsmiths. Since the early 2000s, however, due to a combination of declining gold jewellery consumption and the emergence of more competitive gold jewellery export nations, primarily China, India, Turkey and the US, Italy’s gold jewellery sector has experienced a notable decline in export volumes. Naturally, as the Italian gold jewelry manufacturing sector shrunk during the 2000s, the country no longer needed to import as much gold as previously, so there has also been a noticeable shift from Italy being a sizeable importer of gold in the early 2000s, to it becoming a net exporter of gold after 2010. Nonetheless, there is still a substantial gold market within Italy, despite the erosion of competitiveness within the gold jewellery export sector. Three Italian gold refineries/ trading companies are critical components of the Italian gold market. These three entities, TCA, Italpreziosi, and Chimet, are literally in a small area of Arezzo in the province of Tuscany. As Arezzo is one of Italy’s main historical goldsmith hubs, this clustering is not surprising. TCA is a precious metals refinery headquartered in Capolona, just outside Arezzo. It also has branch offices in Vicenza, and Valenza (near Alessandria), and so TCA is represented in all three major Italian goldsmith disctricts. TCA’s refinery has an annual refining capacity of 200 tonnes of gold and 400 tonnes of silver. Within gold refining, TCA mostly recovers and refines recycled and scrap gold from jewellery, electronic and other sources, and the refinery produces a range of investment grade gold bars from 5 grams up to 400oz Good Delivery bars. TCA also has an in-house precious metals trading capability. Italpreziosi is a precious metals trading and refining company whose refining plant is located in San Zeno, just outside Arezzo. The refinery, which began operations in 2013, has an annual throughput capacity of over 100 tonnes of gold per annum and 250 tonnes of silver, and sources its material from industrial and jewellery scrap, as well as from mining and bullion bank sources. The company also manufactures a range of investment grade gold bars. Prior to 2013, Italpreziosi specialised as a precious metals trading house, and continues to do so. Its trading desk quotes precious metals spot and forward prices, financial management of precious metals transactions, and metal logistics and delivery. Italpreziosi’s trading business has developed an order management platform called Italplatform which its suppliers and customers can use to specify transaction prices, fix orders, and keep track of orders. Banks can also use the Italplatform platform to trade Italpreziosi investment gold. The refinery’s own branded investment gold bars can also be purchased from its online store, which also sells a selction of gold coins such as the Canadian Maple Leaf, South African Krugerrand and Alerian Eagle. In more of the more interesting gold market distribution models, Italpreziosi runs an investment gold trading platform in conjunction with Directa, an Italian financial brokerage (SIM), through which Italian savings and commercial banks can trade physical gold and offer physical gold to their customers. The platform, called Physical Gold Platform (PGP), was launched in 2012, and now has more than 70 participating banking institutions, mostly local institutions based in the Trentino and Veneto regions of Northern Italy, but also banks located further south in regions such as Campania and Emilia Romagna. Chimet, or ‘Chimica Metallurgica Toscana’ (Tuscan Metallurgical Chemistry) is a precious metals recovery and refinery operation based just outside Arezzo. It also has a branch office in Vicenza. Chimet was historically a division of Unoaerre, a goldsmith from the Arezzo area. Like Italpresiosi and TCA, Chimet has a precious metals trading capcbility, as well as metal logistics and delivery services. TCA and Italpreziosi are Associates of the London Bullion Market Association (LBMA). TCA and Chimet are both accredited on the LBMA’s current good delivery list for gold(400oz bars). Turkish gold refinery, Nadir, headquartered in Istanbul, also maintains a representative office, Nadir Gold Italy, in the Italian goldsmith hub of Vicenza. According to officially reported gold holdings, and excluding the gold holdings of the International Monetary Fund (IMF), the Banca d’Italia is ranked as the world’s third largest official holder of gold after the US and Germany, with total gold holdings of 2,451.8 tonnes. Italy’s gold reserves have remained constant at 2451.8 tonnes since 1999. Although the Banca d´Italia has been a signatory to all 4 Central Bank Gold Agreements and could have conducted gold sales between 1999 and the present within the limits of the agreements, it did not engage in any gold sales under either CBGA1 (1999-2004), CBGA2 (2004-2009), or CBGA3 (2009-2014), and as of now, has not conducted any sales under CBGA4 (2014-2019). With 2,451.8 tonnes of gold, the Banca d’Italia holds marginally more than the Banque de France, which claims official gold holdings of 2,435.4 tonnes. In April 2014, the Banca d’Italia, Italy’s central bank, published a document detailing the storage locations and composition of the country’s gold reserves. The document highlights that the Italian gold is held across four locations, three of which are outside Italy. In its detailed 3 page report focusing on its gold reserves, the Banca d’Italia reveals that 1,199.4 tonnes, or nearly half the total, is held in the Bank’s own vaults under its Palazzo Koch headquarters on Via Nazionale in Rome, while the majority of the other half is stored in the Federal Reserve Bank’s gold vault in New York. The Bank’s report also states that smaller amounts of its gold are stored at the Bank of England in London, and at the vaults of the Swiss National Bank in Berne, Switzerland. Austria, France and Italy each have a claim on being considered among Europe’s tier-one gold markets. Austria has a very sophisticated gold refining and minting sector, and its wholesalers, distributors and gold-friendly banks integrate seamlessly into the German speaking gold markets of Switzerland and Germany. Despite some setbacks, the Italian gold market is still important for its gold jewellery sector, and the large Italian gold trading companies – with their refineries – are plugged into the wider market, for example Italpreziosi’s gold transaction collaboration with Italian banks via Directa. Notably, the LBMA views these two countries as important gold markets, for it held its 2015 annual conference in Vienna, Austria, and its 2013 annual conference in Rome, Italy. France’s historic gold role in the form of the Paris gold market may have diminished somewhat, but the Paris gold fix still exists, albeit in a more minor form, and the French bullion banks are as influential as ever, in the London Gold Market and elsewhere. The mighty Banque de France still, it would appear, is a transnational facilitator in the central bank gold market, but since the Banque is so secretive in this regard, details of these activities are not in the public domain. On a geographic basis, all three markets, Italy, Austria and France, also border Europe’s largest physical market, namely Switzerland, and each boarder’s one of the other three. While the London and Swiss, and possibly German gold markets will invariably come to mind when discussing gold markets in Europe, it would be remiss to discount these other three which each has its own unique history and market depth.